This is evacuation camp made of corrugated board with 6-month durability for victims who lost their houses due to major disaster such as earthquake. 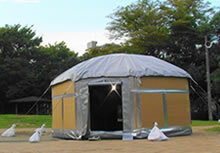 The biggest features of this product are approximately 6-month durability against rain and wind in spite of being made of corrugated board and easy assembly by disaster victims without special technique. Aid workers and victims can assemble Octagon carrying it to disaster area to provide space if it is stored for emergency. Disaster victims can be released from poor and uncomfortable surroundings (staying outdoors or group living), ensure adequate sleep and live comfortable lives in disaster area in mind and body. Municipality can start disaster-relief activity at an early date by protecting citizens. Private sectors can resume their corporate activities at an early date by protecting their employees. It can quickly provide space with privacy protection required in many scenes including medical service and changing room so that it promises enormous effect. Light corrugated board is used for Octagon, but octagon framework supports its entire structure. In addition, 80kg of corrugated board weight in total actually provides the stability against wind. The inclination of the roof helps smooth slide so that it prevents fallen snow and rain from being kept on the roof. It takes about 2-3 hours to assemble Octagon with 4 people (2 people at minimum for assembly). Special tool is not required for assembly and everything necessary is in the box.